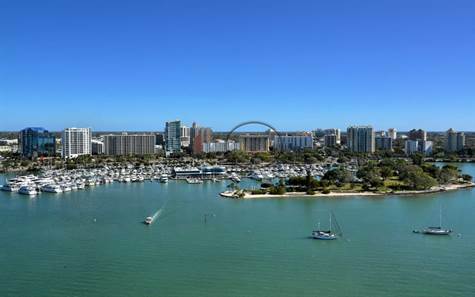 Garage: "Assigned parking plus guest parking"
Stunning panoramic views of Sarasota Bay are yours when you live in this highly prized end unit on the most coveted floor in Dolphin Towers. This remodeled 1390’ u/air 2 bedroom 2 bath condo has views of Sarasota Bay from both bedrooms, the great room, dining room & even the new kitchen which includes gorgeous granite counter tops, under cabinet lighting, new cabinets & appliances (new stainless steel appliances coming soon). The unit also includes marble tile flooring, new carpet, updated bathrooms, light neutral wall colors, & best of all, thanks to the dramatic windows throughout, the unit is bathed in spectacular Florida sunshine. You will love the contemporary feel the professionally designed unit offers as well as enjoy stunning sunsets & bay views that can’t be found anywhere else. The fully renovated complex offers 1st class amenities including a fitness room, on-site manager, welcoming lobby, air-conditioned storage, updated pool/patio area with the world-renowned benefits of Main Street, Palm Avenue and the famous Sarasota Bayfront within seconds of your front door. Enjoy the finest in shopping, dining, entertainment, the beautiful waterfront park, marina, art galleries, theaters and everything downtown Sarasota has to offer. Dolphin Towers is wired for FIOS, features impact glass, gorgeous new interior hallway carpet and doors plus a guest suite. If you want million-dollar views from every room and have been looking for a newly remodeled unit at a terrific price, look no further, this is it! Condo fee is $732 monthly and it includes basic cable, community pool, escrow reserves, Insurance on building, Maintenance, on exterior of building, maintenance common grounds, manager, & trash.